If you went to a British cinema to see the Paul Newman classic Hud in 1963 chances are you also saw the support feature, Tomorrow At Ten. Utterly unpretentious, this ‘B’ film is another that virtually disappeared (being previously unavailable on VHS or DVD) before being rescued from cinematic oblivion by Odeon Entertainment. This release is all the more praiseworthy because of its refusal to kow-tow to the ridiculous political correctness that has come to dominate our society today. Does the film focus on some extremist viewpoint that could encourage anti-social behaviour? Does it promote some illegal activity in a glorified fashion? Worse- the film actually dares to include a toy golliwog as a main object of attention (almost serving as a Hitchcockian ‘MacGuffin’)! The informative booklet puts this into context - ‘the fact that a golliwog is the central character of the film would be unheard of in today’s politically correct world’. The plot of Tomorrow At Ten is disarmingly simple, but not immediately obvious- the audience shares the knowledge that the main characters have but, in a twist, then becomes more knowledgeable, thereby strengthening the tension and bringing the audience into a viewing position where they begin to question what they would do. This empathetic involvement in the film is created mainly by the very ‘could-happen-ness’ of the whole situation- a rationale is provided, characters behaving in a perfectly understandable manner. What is particularly credible is the change in Anthony Chester’s character as the tension mounts- we see a man teetering on the edge of madness and hysteria who behaves accordingly, the moment of sheer inexplicable fury undermines most of what has gone before and places him in an even worse situation. The drama inherent in a premise like that of Tomorrow At Ten would not be as effective if it were not for the skilled use of both time and place. Director Lance Comfort (bringing an intriguingly varied c.v. to the film) utilises frequent reminders of the transitory nature of time in the clocks that link sequences together (reminiscent of other time-based films ranging from High Noon(1952) to Time Lock(1957) yet provides surprisingly few locations. The effect of this is to avoid distraction away from the narrative’s main thrust as well as to build a sense of familiarity, and therefore empathy, with the Chester family as well as with Parnell and Grey. In the character of Parnell himself the director fashions a detective who combines the ‘hard-boiled’ suffering of a Film Noir law-enforcer with a forerunner of the 1960s and 1970s television ‘cop’ who again has to suffer for his job. One of the interesting motifs running throughout the film is the contrast between innocence and experience. Thus, as young Jonathan Chester does not read the danger signs that we, the audience, begin to early on in the film, so Parnell believes he can cause Marlowe to “break”. The distinction between those with experience and those without is then allied to the time scenario to add an extra dramatic twist- although Parnell feels he has the experience to deal with Marlowe he is constrained by time limitations before the latter’s flight leaves. This interim deadline creates another layer of suspense as does the conflict between Parnell, Marlowe, Anthony Chester and then Parnell’s glory-seeking boss Bewley. Ironically, it is the past history of experience between Parnell and Bewley that almost results in a setback (Parnell being taken off the case) yet the innocence and inexperience of Anthony Chester that does cause the major setback. This setback demarcates the second phase of the film- the race against time is still there, but now there is to be no possibility of salvation- young Jonathan has to be found by ten o’clock or he will die. Given its ‘B’- film status, it might be expected that the film would end in a very conventional manner, but it does not. In fact, the closing sequence of the film almost goes against our expectations of the ‘race against time’ sub-genre in a sweet irony that is once more plausible but again very much unanticipated. If anything, the ending of the film is understated, its protagonists upper-class status perhaps not allowing for outbursts of extreme emotion. Nevertheless, the film tells its story concisely and never outstays its welcome- a lesson for filmmakers in 21st Century Hollywood!- the narrative appropriately tense throughout. As well as the stars of the film, one of the pleasures in British cinema of this period is the supporting cast- two names that figure are Kenneth Cope (as Parnell’s supportive sidekick Sergeant Grey), perhaps better known as the late Marty Hopkirk in the television series Randall and Hopkirk (Deceased), and also William Hartnell. Given only a brief (but fascinating) cameo as Marlowe’s father, Hartnell would be ensconced in a larger role two years later as the time-travelling Doctor Who. Such names add to familiar ones (in this case John Gregson, Robert Shaw and Alec Clunes) to help make Tomorrow At Ten a very succinct film. It is beautifully restored by Odeon Entertainment, the early 1960s monochrome cinematography being aesthetically pleasing. 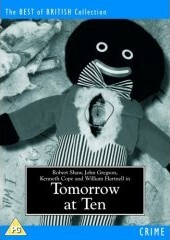 The DVD comes with a booklet which provides just the right amount of supplementary reading, commenting at one stage that ‘these were the days of innocence when golliwogs were simply a toy adored by children’. It would be nice if we could return to such days. With the release of Tomorrow At Ten, we can.